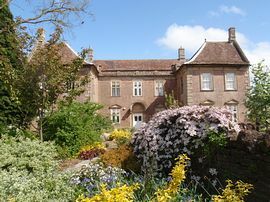 The Old Parsonage was built in the 1680's and was owned by The Duchy of Cornwall for over 200 years. It retains many of its beautiful period features including wooden panelling, shutters, period open fireplaces and a wonderful original 17th Century staircase. Rooms have an interesting collection of antique furniture and beautiful chandeliers combined with modern facilities to make your stay very comfortable and relaxing. 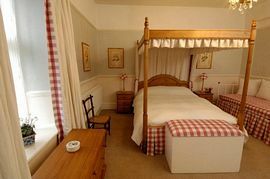 We have three beautifully decorated guest bedrooms. 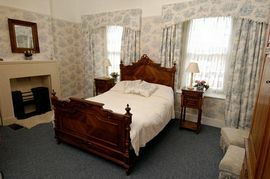 All rooms have tea/coffee making facilities and TV & WiFi. 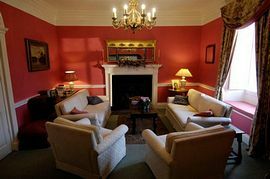 Guest have their own large sitting room and can enjoy a freshly cooked traditional English breakfast with home-made bread and jam in the beautiful beamed dining room. 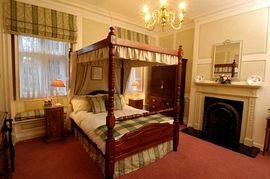 Spacious double four poster bed and single bed, decorated with pretty toile wall paper and antique linen with period fireplace and power shower room. From traffic lights on A37 in Farrington Gurney take A362. After 300yds turn left into Farrington Way. At T junction turn left and continue towards dead end. The Old Parsonage is the last set of gates on left before dead end. "Memorable stay" "A gem" "A lovely stay. Beautiful building and made to feel so welcome" "Excellent in all departments"